A few weeks ago, I saw on twitter someone (Sarah Reed) mentioning something that she called the “Play 10 Games 10 Times” challenge. I saw it and, while it seemed like something that might be interesting, I dismissed it as something I wouldn’t be able to do. I am, as some say, a proud member of the Cult of the New. What’s that? Well, it’s a sub-group of boardgamers who really really enjoy trying new games. I love playing new games, reading about new games and getting new games. The problem with this is while it was fine a few years ago since there wasn’t a lot of new games coming out, right now there are so many game coming out all the time that it doesn’t leave me with much time to revisit games that I liked the first time I played, never mind those which I wasn’t all that sure about. So the idea stayed in the back of my mind (although I forgot who mentioned it until recently) and a few days ago I mentioned it on twitter as a personal challenge. I’ve played a few games recently that I really want to explore more (Hegemonic and Euphoria and yes, their review is coming) and I figured that there must be at least 10 games in my collection that I would/could/should play at least 10 times in the upcoming year. A few people who follow me decided to jump in as well and as a result, something I was just sort of considering has become a real challenge. Yup, I’m in. I’m going to try 10 different games 10 times in the next year. While this will be fun, it’ll be a challenge to play the same games while all the new and shiny come out. There are a few other people in on this, like Rhiannon Ochs, who’s tracking her progress on her blog and all the other happy folks doing so on the ‘Geek. Can we make it? Well, we’ll find out in a year! You can also follow the madness on Twitter by following the #10X10in2014 hashtag. Which games do I really want to play that often? Seems like a simple question, but a little harder than it would first appear. What games do I have a chance to bring to the table 10 times? This is harder since it doesn’t depend directly on me, but rather the group of players that I have. It’s all well and good that I want to play these games, but will the other people I play with want to play that many times? I’m lucky enough to be a member of two very different groups (one at work, one outside of work), which should help greatly with this. How long are the games on the list? I’ve run in a little bit of a problem with this since I wanted to make sure that I’d be able to play these games. For example, if had put 1817 on the list (or a number of other very long games I own), but unless things change drastically, it would eat up about half of my play time for the upcoming year and thus would not leave me enough time for the other games. So, in selecting, I need to be strategic. Is there a good diversity of games or am I going to find myself playing very very similar games the whole year? I find diversity in my gaming diet to be very important. I might love a good burger, but if that’s all I eat, I’ll get sick of it sooner rather than later. So, now I know what I need to keep in mind. Let’s look at the list. Even with these strict criteria, it was still difficult to narrow down the list to just 10. My first pass through resulted in 20 games, not counting games that I know are coming out soon and that I’ve got my eye on. In the end, here are the games selected along with the reason for selecting them. 18XX: Yup, the first game is actually not a game but a whole family of games. I couldn’t attempt this challenge without having any 18XX in the mix. On the one hand, I love these games (I have something like 20 different ones) but, on the other hand, they tend to be fairly long games (1817 can last an easy 8-10 hours). So what’s a gamer to do? Having them as a family means that I’ll need to play just about one 18XX game per month in order to complete the challenge. Good thing that I have people in my gaming groups that could play this almost every week. Lots of diversity at a very low cost of rules explanation. Should be fun to try and play this that often. Age of Steam/Steam: This is a perfect game for this challenge. I love Age of Steam and I used to play on a very regular basis but it has dropped off my radar in the last 3-4 years. With this challenge (and the great collection of maps that I already own), I’ll be able to start exploring this great game again. As far as the Age of Steam / Steam divide, I figure that it will depend on the group and maps I’d like to play. I have a soft spot for Age since it is the first one I played and I don’t mind the early cutthroat aspect of the game. Hegemonic: One of my recent acquisition, this is a game that fascinates me: it calls itself a 4X game where it doesn’t quite feel like it and yet it is epic in scale if not in play time. I love the way it allows the player to use any of their networks to attack/overtake other player’s networks and how the tech is cool, but not everything. The very low luck factor is also another bonus as it becomes hard to get screwed over, unless you really didn’t plan well. With a group of experienced players, it probably can be played in about 2 hours, which leaves times for other games on this list. I’m also looking forward to trying this as a 2 player game. 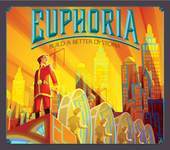 Euphoria: Another recent acquisition and in the list since there needed to be at least one Worker Placement game (love worker placement and actually, there are 3 in the list) and this is perhaps one of the nicer, easy flowing nasty WP games I’ve played in some time. I love the theme, which is close to Metropolis and the game is just gorgeous. Nice bits, nice board and very simple once you get going. With only one worker to place during a turn, there isn’t a lot of down time between actions. Still unsure what the sweet spot for number of players is, but I get the feeling that I will find out this year. B-29 Superfortress: With most of the other games being longer games, I needed to put in a solo game so that I could get some gaming for this challenge outside of my regular gaming time. I’ve got a whole bunch of solo games already and while all of the other ones either fall on the very long/complex end of the spectrum (Steel Wolves, D-Day at Omaha Beach) or very short/simple (We Must Tell the Emperor, Infection), only B-29 falls somewhere in between, with a linked campaign and a very cinematic feel. I also have the Hell over Korea expansion, which will bring some diversity as well. Russian Railroads: I don’t own this game… yet. It’s only a question of time since it has everything that I love in a game: trains, worker placement and some nice bits. I started to hear about this game a few months back and it’s been on my radar ever since. In the last few weeks more and more reviews have been coming out, with everything indicating that it is the type of game that I’d like. I missed my chance to play it at the last Stack Academy but it has only strengthened my resolve to get it and play the hell out of it. 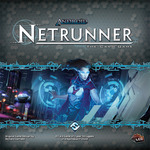 Android: Netrunner: ah yes, Netrunner. Loved the game when it originally came out and love it even more now, with its non-collectible aspect. What’s more, there’s a bunch of people who play at work, so this should be relatively easy to rack up 10 plays. Again, with all the expansions and the diversity of the cards (plus the two totally different sides), it will offer a very different experience every time it will hit the table. One of the simpler choice that I had to make for this list and the very reason for this challenge, making me revisit a game that will reward me with every extra play. The Duke: the only other pure 2 player game on the list and one that can have a short playing time. I love this game (reviewed here) and I really think that there is a lot of replay value in there. It is also perfect for those lunchtime game sessions at work and should help me reach the 8 or 9 play a month that I need if I want to succeed at this challenge. Plus the game is a lot of fun and the expansions are very intriguing. Briefcase: Another game that I enjoyed the first time I played it and that unfortunately hasn’t made its way back to the table. This is a twist on the traditional deck-building game and as such has a lot of replay value and depth to it. The twist? you can use the other player’s cards if you pay a fee. Since it is a combination deck-builder/economic engine building game, and that the set up can change depending on the card selection, there is a lot to explore here. Ground Floor: Ah yes, what’s that you say? Another game that made a great impression on initial play and that then never hit the table again? Yup. And this is why it’s on the list. I really liked it and never got around to playing again. Since we played as a 6 player game, I really want to try it again with 4 players, just to see how it feels and how fast/short it can be. I’m pretty sure we can get a game of this done in under two hours, tops. Oh, and that’s the third Worker Placement game on the list. What do you mean, alternates? Yup, haven’t even started doing the challenge and I already have a few games that, while they haven’t been released yet, are in the wings, just in case that one of the games in the list don’t quite work out. Sail to India: Very high hope for this one with it’s microgame components but nice playing time. VivaJava / VivaJava the Dice Game: Another game that I’ve heard lots of good stuff about and the dice version of it looks like it is likely to hit the table often at home. Brew Crafters: a worker placement game about beer brewing? Sign me up! Paperback: Deck building word game which I tried as a print-and-play last summer. Should see lots of play at home. This might be one of the game which knocks out some of the bigger boys in the main list with its short playing time. Captain of Industry: There is a lot to like in this game and if the promise holds, I predict that it will be the type of cutthroat game that will hit the table often. Of course, that’s only the games I know about. Who knows what the next 6 months will bring. Will any of those games knock out some of the games in the list when they come out? Only time will tell! This entry was posted in General and tagged 10X10in2014, Play 10 games 10 times challenge on December 15, 2013 by TopDog.